Now, let’s break all the requirements one by one to specify exact hardware we need. What is crucial for a Fortnite laptop? Right now, most laptops come with 7th or 8th generation Intel Core processors. All of them satisfy minimum requirements for Fortnite. That means that any i3/i5/i7 processor that starts with a 7 or an 8 in its model name will be able to run Fortnite. There are a few exceptions such as i3-6100U, i3-7100U, i7-7Y75 that we’ll stay clear of. But that’s just the minimum requirement. 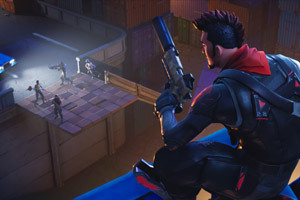 To play Fortnite at higher settings and/or higher framerates we’ll need something better. We’ll have to ditch all i3 processors and just stick to i5 and i7. Also, we can use AMD Ryzen 7 processors. If you can’t afford a laptop (~$750) with a dedicated Nvidia or AMD graphics, you can use an integrated video chip that comes with the processor. It’s convenient as all laptops have some kind of graphics module and you could save a lot of money by forgoing a fast graphics card. The bad part is that these GPUs are very limited in their performance and might struggle to get even playable framerates. That one of the reasons why I discourage from buying a laptop with Intel 6th gen processors or older (for example i5-6200U) as these processors come with very slow GPUs that will struggle to even get 30 FPS. With modern consumer-level processors we can expect Intel HD 620, UHD 620, HD 630 and UHD 630. The 620s will reach ~35 average FPS and 630s get ~40 avg. FPS on 1920×1080 and lowest visual settings. If you want to play Fortnite on better settings or higher resolutions, you’ll need a dedicated graphics card. Nearly all of them come from Nvidia with a few exceptions such from AMD Radeon line. Fortnite does not have any special requirements for RAM so we should aim for 8 GB under $900 and 16 GB over $900. 32 GB is common for laptop over $2,000 unless they had a custom upgrade in which case we can find gaming laptops with 32 GB starting at $1,400. It’s not a requirement to play Fortnite, but it’s essential for anyone who wants responsive laptop for years to come. Spinning HDDs are slower from the start and they get slower over time, mostly due to fragmentation. Meanwhile, a Solid State Drive is crucial for quick boot up, fast game launch times and web browser responsiveness. The problem with SSDs is that they’re a lot more expensive per GB. In budget laptops we can find only 128-256 GB drives. And even that iss not always possible since we’re trying to cram a good CPU and GPU for Fortnite. SSD should be mandatory for any laptop over $1000. And for laptops over $1,200 I expect to find the SSD using PCIe over SATA for even higher throughput. Up until that point, I can understand going for a faster CPU+GPU combo and leaving SSD upgrade in the future. This is entirely optional and entirely awesome. High refresh rate means that the display is updated more than 60 times a second (60Hz). That results in lower latency and more up-to-date vision. It’s one of the few things that will instantly boost your results. The others being higher FPS and a drastically faster display response time. I game on a 240Hz external display and it definitely makes a big difference. Laptops do not have panels that fast but you can get most of the benefits with a 120Hz or 144Hz panel. These are often found in laptops over $2000, but in some rare cases they’re as cheap as $1000. But they almost always come with a cost of either display brightness, contrast or just general CPU, GPU, RAM, SSD performance. I urge anyone who can spend over $2k for a gaming laptop to try out a laptop with 120Hz/144Hz panel. For everyone else – you’ll be better off spending that money on better components or just pocketing it. Just make sure you’re not capped at 60 FPS. Gaming laptops are not known for their light weight or long battery life. Don’t get me wrong, the situation is slightly getting better over the years due to more power efficient processors and more better production processes in GPUs making underclocked Nvidia Max-Q graphics cards a viable even for avid gamers. But it’s still miles behind ultrabooks and some cheap laptops that are not geared for gaming. But whenever possible I’ll prioritize a lighter laptop over a heavier one if they are of similar performance and the lighter laptop does not start throttling under a moderate workload due to high internal temperature. Overall, expect most of my recommended laptops to be a bit heavier than average. That’s the price we have to pay to get good performance at a reasonable price. The cheapest laptop for Fortnite is Acer Aspire 5 A515-51G-515J. It seems that Acer has nailed down the budget laptop market. This is no exception. The first laptop on the list already has a discrete graphics card and an i5 processor. That should be already enough to play Fortnite at 80 FPS on medium settings (1080p, I’ll only reference benchmarks on 1920×1080). It has all the basics of CPU, GPU, RAM, SSD and it even doesn’t cut many corners when it comes to weight and battery life. Roughly 6 hours of battery life is surprisingly good for a laptop that comes with a solid set of specs. The main issue with Acer Aspire 5 is its display which has poor viewing angles, weak brightness and contrast. It also has a limited storage which might fill up quickly if you have a lot more games in your library. That might require a future upgrade via 2.5″ bay. We’re coming to Lenovo Legion which offers a much better graphics card – Nvidia GeForce GTX 1050. It can go up to 130 FPS on medium settings and it is even playable on Epic preset, though there it might get only ~40 FPS. If you want the best bang for your buck and you’re OK with a mediocre display – MSI GL62M is worth your attention. It comes with significantly better CPU and GPU setup without increasing the overall weight. In this particular laptop, MSI decided to make a trade-off – it has a large 1 TB HDD storage so you won’t run out of space but it has a very confined SSD – just 128 GB. After counting out space needed for Windows, formatting overhead, GiB to GB conversion and space for provisioning, you’ll have ~70 GB of usable space left. Also, it comes with a similar panel as Acer Aspire, which will seem washed out compared to modern IPS panels. In the past few years, Eluktronics has become one of the best-received new laptop brands in US. It seems to have built its reputation with a careful selection of hardware and responsive customer service. They build Clevo-based laptops which already tells us that they’ll be a bit bulkier than your average laptop and most likely there’s not much room for a large battery. And that’s correct. It keeps the same CPU & GPU as the previous laptop, but it has a better looking wide-angle IPS display, twice the memory and finally a large 512 GB SSD. There’s a similar laptop from Asus – ASUS ROG Strix GL503GE-ES52. It is ~$200 dollars cheaper, comes with similar hardware, but instead of a 17.3″ IPS panel, it has a 15.6″ 120Hz TN display and has 2 times less SSD storage and RAM. A custom built Pavilion 15t is one of the few laptops that costs over $1000 and still offers great value. A high-end i7-8750H processor (better than any other on the list) delivers desktop-like performance. The same can be said about its GeForce GTX 1060 graphics card. This CPU & GPU combo delivers a stunning 100 FPS on high settings and just 20 FPS less on the Epic preset. Who needs so many frames? Well, a 144 Hz laptop that is! A medium/high settings mix can easily max out this refresh rate and make your gaming evenings much more enjoyable. And wait, there’s more! It has a beautiful 500 GB NVMe SSD and 1 TB HDD combo. That means you’ll be getting a blazing fast start up and there will be plenty of space for a massive gaming collection. It even looks very sleek – not as boring as a 2010 office laptop but not so flashy that it would make you look like a progamer wannabe. It also has an average weight, battery life and an IPS panel. At least on paper, it seems as a great laptop for work, studies and gaming. It’s not a perfect laptop though. It is a new laptop so there aren’t many reviews on its possible shortcomings or even defects. Luckily it has a 3-year warranty but it doesn’t cover everything so I’m still left wondering if this deal is too good to be true. If you want an absolute beast of a laptop – ASUS recently released one on the scene. It comes with nearly identical specs as HP Pavilion 15t except it has less SSD space but an even faster graphics card. It’s so fast, that you can expect 120 FPS on Epic preset. That would put most desktops to shame.